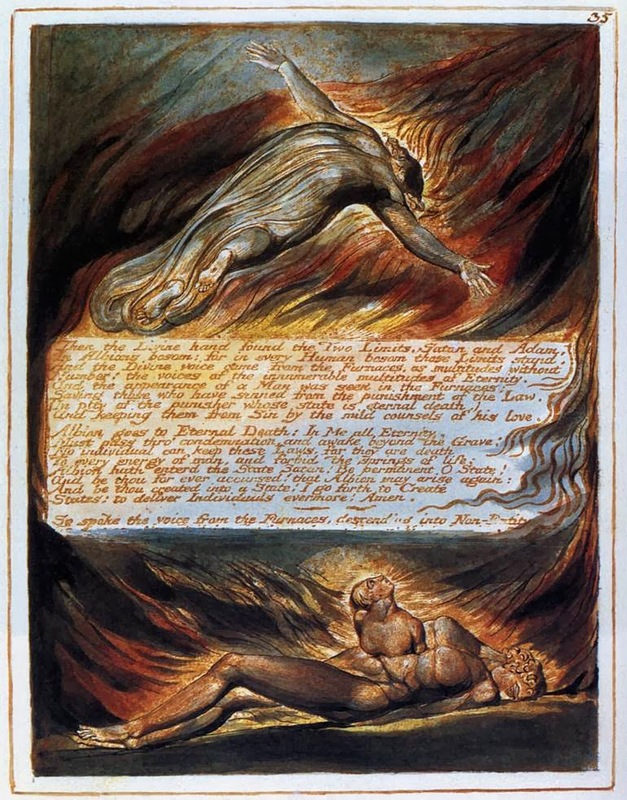 That’s a pretty big claim and others may want to suggest alternative candidates for the first graphic novelist, but I’ve always been struck by the way the Blake was master of both word and image, and mixed them both on his engraving plates with unrivalled skill. I thought, since my first graphic novel, (co-written with my brother Julian Sedgwick and illustrated by Marc Olivent and John Higgins) came out this past week, that it would be a good idea to write a little more about why the book is called Dark Satanic Mills, and why William Blake is such a large influence on the project. Blake: poet, painter, engraver, and visionary. Born 1757, died 1827. There was a massive exhibition on the life and work of William Blake at Tate Britain some years ago. I remember peering through the glass of a display cabinet at one of Blake’s handmade books, on one spread of which was a picture of the human anatomy. Not content with the depiction of the exterior of the body, Blake had made paper flaps to be opened, to reveal the organs inside the chest too. This probably makes Blake the first paper engineer too, but it’s just one small example of the inventiveness of this rebellious, dissenting figure. Dissent was at the heart of Blake’s credo – his creation of a personal mythology that rivals that of more than a few small nations’ remains both at once his greatest achievement, and the reason, I believe, that he remains underrated and unexplored: his works are simply so vast and so impenetrable that they defy easy understanding. It would take a lifetime of study to understand Blake fully, but that’s not the only reason he does not feature as highly on the list of British cultural icons as he should. I also think that we’re not very good at celebrating the genius who excels not just in one field of artistry, but many. I believe there’s a prejudice; no one can be that good at so many things. But Blake was. And yet he was largely ignored and derided in his own time, and part of the reason for that is his dissension. If there is one simple message you can derive from studying Blake; it’s this: believe what you want to believe, not what you are told to believe. Which brings us to Dark Satanic Mills. Those famous three words from the poem nowadays known as Jerusalem are often thought to refer to the factories of the Industrial Revolution. But to Blake it meant something different; the dark satanic mills were the churches of orthodox religion; which he saw as places of enslavement and oppression; which did not allow man or woman to follow their own spiritual path. Blake came from a long line of dissenting believers, but he took things to a new level. Which brings me at last to our graphic novel; a world set in a near-future Britain in which the climb to hegemony of a new church threatens anyone who does not share their beliefs. It’s no longer safe to believe in any other religion; it’s not even safe to be an atheist, as one of the book’s heroes is. Thomas Aikenhead is an atheist preacher, and is, incidentally, named after the last man in the British Isles to be executed for being blasphemy. You are right about Blake, odd and maybe cranky but he was innovative and certainly he loved humanity. A friend of mine from college days worked on framing the prints for that exhibition. He was spellbound by Blake's focus and understanding of the media he used. Months after the exhibition closed he was still excited by handling and studying Blake's work.